4* single-storey cottage overlooking historic courtyard. Sleeps 4, but 2 person discounts - just ask! Stunning rural location, with shops/pubs within 1 mile. Circular walks from the door. 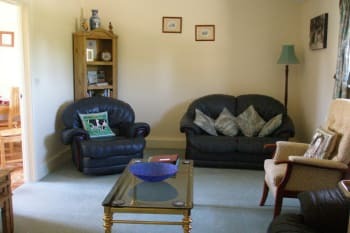 Two bedrooms both with en-suite facilities and full central heating. Enclosed garden. Off-road parking. Secure storage available for bikes, canoes, etc. There are no rooms available at Cowshed Cottage and The Dairy for these dates. Secure dry storage for bikes/canoes, etc. A very warm welcome from Eileen and John including the most delicious welsh cakes. Cowshed cottage is beautiful; very comfortable and so clean - the best I've ever stayed in so far. Eileen and john have equipped it with absolutely everything needed for a stay. There's a gorgeous little private garden. 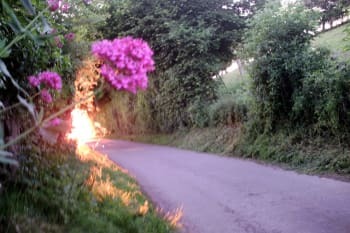 The cottage is close to the main roads in all directions.We could easily get to Coleford, Monmouth, Symmonds Yat. The Black Mountains are only 40 minutes away. The Cycling Centre in the Forest of Dean is about 30 minutes away. The New Inn in Ross Rd, Coleford GL16 7NT does really lovely food - we went twice! We also recommend Cinnamons 12 St John St, Coleford GL16 8AR Indian restaurant or take away - really nice food. Many thanks for your kind comments - you crammed a lot into your short stay with us, but there’s still plenty more to see and do!! Elaine was lovely, helpful but not intrusive. The many items included tea, coffee etc was a helpful addition as was the inclusion of towels. Plenty of information in the folders. So pleased you enjoyed your stay with us, and the weather for March was brilliant for your birdwatching! An excellent stay. Everything you could possibly want is provided plus a load of things you didn't even know you wanted. Very comfortable, warm and spacious. Lots of books and games, TV and Wi-Fi. You really only need to take clothes and toiletries! Lovely area, beautiful scenery, and so close to many tourist attractions. The Ostrich in Newland must not be missed for a superb meal with extensive menu and good prices, great atmosphere and welcoming hospitality. We were extremely pleased with out stay in 2017, so did not hesitate to book again when we wanted to come this year. 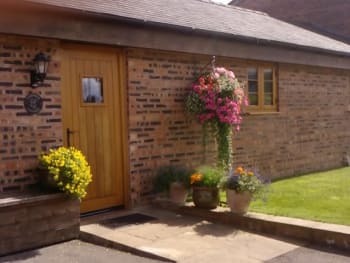 We were not disappointed - this is still one of the best cottages we have ever had, as much for the many personal touches and welcome as for the cottage itself. Highly recommended. Very friendly and helpful, nothing was too much trouble. Would advise that you book a table at local restaurants as we found that they were unable to find a table if you just show up. Warm and friendly welcome. Excellent accommodation Easy parking close to front door. Small attractive garden . Beautiful views. Many walks in the countryside. 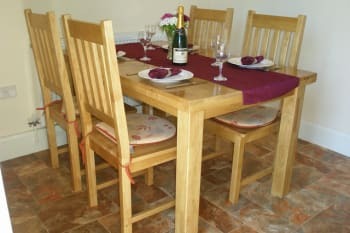 cottage all on a level ground floor suitable for less mobile holidaymakers. Close to pubs, town, tourist attractions. Sheep on the hillside. What more could we want! 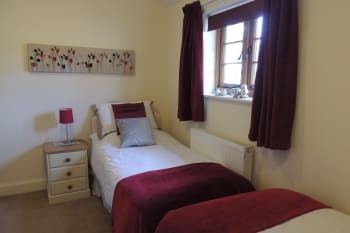 Close to Symonds Yat Rock viewpoint,market town,Tintern Abbey and village, Puzzlewood, Lydney Park Gardens (Spring only) Clearwell Caves, River Wye, Monmouth, including Shire Hall. N.T.round house and viewpoint at The Kymin. All suitable for families or older people. Extremely well appointed cottage. Fantastic location. Hosts were very hospitable. Local pub in Newlands village served great food. Great walks at Symonds Yat. Puzzlewood was a unique, beautiful place to walk. Perfect in every way' Greatly appreciated the little extras and the warmth and friendliness of the welcome. Perfect area for walking for all abilities. An excellent location for all attractions of the Forest. We did not eat out much but did like the Kaplan Restaurant in Coleford with an extensive daily menu. Welcoming gift of Welsh cakes, a pint of milk and box of chocolates was a nice touch. Tea, coffee and sugar also provided but strangely, no salt or pepper in the cruet. Would have liked brighter bedside lights in the bedrooms - a little too dark to read in bed. Some of the tourist information leaflets were several years out of date but we left hundreds of our own so shouldn't be a problem now! As you can see, if the only thing missing was a bit of pepper, we had a fantastic time. Very friendly and welcoming (delicious, home-made Welsh cakes waiting for us! 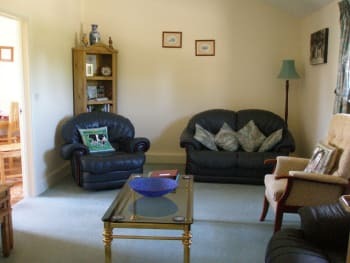 ), a relaxing, home-from-home cottage, comfortable chairs and bed, and great facilities. An outside sitting area with tables and chairs is the icing on the cake. 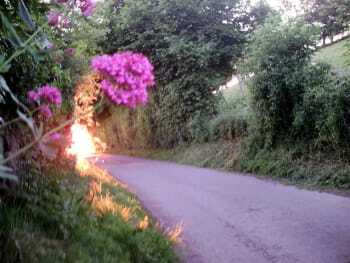 Coleford is a half-hour walk via the scenic and interesting "burial path" (to Newland Church). There are really good walks all around, both in the Forest, across fields, and by the river. Cannop Ponds is a great place for wildlife and one can often see bats feeding over the water at dusk. Tintern Abbey is, of course, glorious, and Goodrich Castle is well worth a visit. Symonds Yat provides unbeatable views over the river, nearby cliffs and surrounding countryside. Altogether perfectly placed in wonderful surroundings. Wonderful cottage, so restful and relaxing. I would definitely stay again. Newlands church and the Ostrich pub there. Puzzle wood, Perrygrove railway, Chepstow beautiful place and Lydney train station very handy. The Dairy is extremely comfortable and very well equipped. The owners go the extra mile - we much appreciated the unexpected Welsh cakes, milk. fresh flowers etc. If you enjoy walking stay here. Just a pity some of the footpaths are not clearly signposted. We recommend visits to Dean Forest Railway, Clearwell Caves, Tintern Abbey, Monmouth and Ross on Wye. 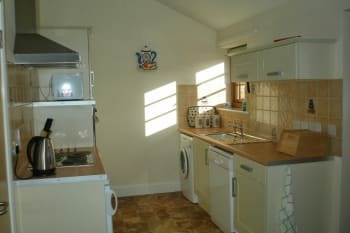 Excellent property with much thought gone into guests' comfort. Our hosts were very welcoming and friendly, and we felt we could call on them for anything although this wasn't necessary. This is the best self catering accommodation we have ever stayed at. Thank you. Many attractions to see in area though we were restricted to wheelchair friendly places. Especially liked the Birds of Prey Centre, the Dean Heritage Centre and the Steam Railway at Norchard. Good value meals at the New Inn, the Old Court Hotel and would highly recommend the Dog and Muffler but all need to have tables reserved in advance. As we lived in Coleford for six years we spent our time visiting friends and walking in the Forest. We did few of the normal 'tourist' things, but did visit and were most impressed by Tewkesbury Abbey and town, and would recommend at least a day to visit it. Excellent accommodation. Hospitable and helpful owners. Countryside, River and Forest all very pretty and unspoilt. The diary is delightful with views in all directions. A small patio garden was a lovely place to spend the late afternoon and evening after long days walking. We never needed our car as walks are on the door step. 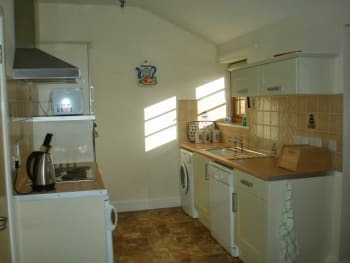 The cottage was immaculate and the kitchen was amazingly well equipped. Eileen and John could not have been more helpful with welcoming welsh cakes and genuine interest in our days in the Forest. Although we did eat there this time The Ostrich is Newland is a treat not to be missed. The Sculpture Trail combines walking and art and is worth a visit. 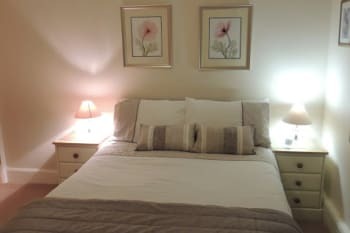 The accomodation is of a high standard and very well presented, and very comfortable. We were greeted by Eileen who bakes excellent welsh cakes! Basics like toilet/kitchen rolls, milk, tea, washing up liquid all provided. The Boat Inn has good beer and is reached by a spectacular footbridge over the River Wye, and the Ostrich in Newland does excellent food in very generous portions. Lovely warm welcome from Eileen Wood after excellent correspondence and communication regarding our booking. Cottage was a perfect base for our walking holiday. Very well equipped, we were warm, cosy and had everything we needed including wonderful views, sunrises and sunsets. 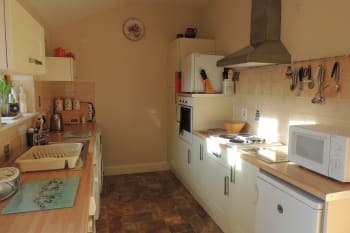 These properties are situated on a farm complex in a peaceful setting close to Coleford in Gloucestershire. They are equipped with everything you would want for a wonderful holiday. Each property has two bedrooms and two bathrooms. There are lots of wonderful off-road walks in the area. Gloucester Docks and Waterways Museum are well worth half a day, or even longer, if you wish to eat there or shop in the Outlet Shopping Centre. There's also the Dean Forest Railway nearby. Monmouth is a lovely town with lots of historic buildings to visit on a walking tour. For shopping Monmouth has a Lidl, M&S Food and a Waitrose. 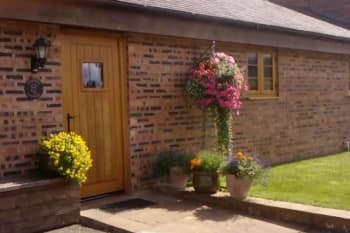 What a fantastic cottage and setting, easy to find, a very good base to go from around the Wye valley. the owner is lovely, and very helpful on local attractions, and leaves home made welsh cakes and a pint of milk to get you going. We will be going back next time! Simons Yat is a must, as it the river trip and canoe hire. Rhagland castle in the summe is great with re-enactment groups. so much to see and do. Fantastic cottage with absolutely everything provided by Eileen who made our short stay here fantastic and we would definitely recommend the Cottage to others. We are a family of four and stayed for 3 nights and did the following which we would recommend: Mountainbiking - we hired bikes for the day and had a really great time. We rode the easy family route twice and the blue route once. The blue route was more challenging. Go Ape - Great fun for everyone. Ostrich Inn - well worth the short drive to Newland but as suggested we walked across the fields from the cottage to the Inn. A lovely walk rewarded by a great meal, but no kids menu so not much if anything for them. Puzzlewood - Worth a trip as the walk through the woods is fun and the kids will love it...slippery paths. The only downside was the lack of wi-fi and mobile network which prevented us from checking out things to do and routes to go. However Eileen did bring this to our attention and as this was a very late booking I had no time to do research beforehand. There is however 3G in the adjoining fields so it was lovely to sit there and do any research as the sun went down. Great place and we highly recommend. We could not fault this cottage in any way.. To have milk in the fridge and homemade welshcakes ready for our arrival was very thoughtful- we could have a cup of tea before unpacking!! 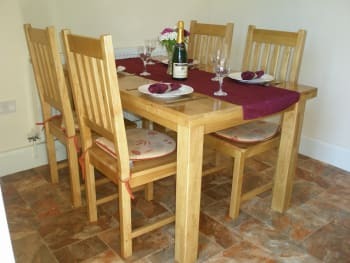 The cottage was like home from home- you really have thought of everything your guests would need. I can't think of anything that was missing! So thank you very much for a most relaxing and enjoyable fer days. The cottage although situated in the countryside,is not far from places to visit. We spent some time in Monmouth and Ross-on-Wye. Lovely shops- lots of them different from your average chain stores. A good choice of nice cafés and hotels for coffe o'r a meal. The cottage has all you need for a comfortable stay. If you want somewhere where you can get awayfrom it all, (no wifi-or mobile phone signal)this is the place!! Local pub within walking distance serves great food and Coleford is just a few minutes away by car for your shopping needs. Walks everywhere all are brilliant. Good family trials, nice pubs and local shops not far away. Fantastic cottage in a wonderful location. We received a warm, friendly welcome and appreciated the tea, milk and tasty lemon drizzle cake which awaited us. Very comfortable sitting room and bedrooms. Well equipped kitchen/diner. Pleasant patio garden. Both ensuite shower rooms were spotless. We found the cottage to be an excellent base for exploring the area. Lots of nice touches like tissues in the bedrooms, rose water spray in the shower rooms, Dvds, books, jigsaws and board games for the evenings. Lots of info provided on places to visit and places to eat. All in all we had a fab holiday. We loved the nearby Ostrich Inn in Newland (great walk from the cottage through the fields to it). Also loved the Italian restaurant. La Piccola, in Monmouth. Enjoyed visiting Goodrich Castle, Puzzlewood, Clearwell Caves, Tintern Abbey, Raglan Castle .....phew ...plenty to do and see. Even managed to travel a little further afield to Hay-on-Wye (lots of quirky book, antique and gift shops). 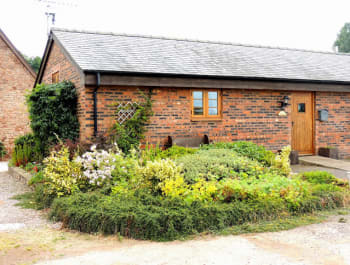 Cowshed Cottage was perfect for a short break or a holiday. My father has limited mobility and the single level accommodation was ideal. The location was great and views around the cottage were delightful. Owners were friendly and helpful. Love the Wye Valley and hope to return soon. Enjoyed visit to Skenfrith Castle ruins, Ross on Wye and Monmonth and further afield Ledbury to the North and Chepstow to South. Particularly enjoyed lunch at Community café/shop in Brockweir near Tintern and also Woods of Whitchuch, a café/ shop and Art gallery. Lovely welcome from Eileen who has thought of everything at Cowshed Cottage. We enjoyed our stay immensely and would highly recommend. Goodrich, Raglan and Chepstow castles all well worth a visit. Walks at Tintern Old Station and Symonds Yat (peregrine walk) with welcome refreshment stops very enjoyable. New restaurant in Monmouth the Estero Lounge ( opposite Waitrose high street entrance) great food available all day. Also excellent Sunday lunch at Ostrich. Many thanks for your lovely comments, I really enjoy sharing our beautiful Forest of Dean/Wye Valley with guests! 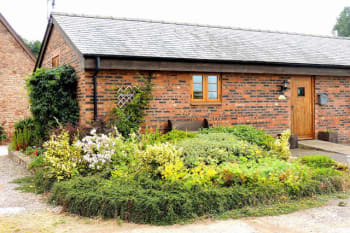 The cottage is a stones throw away from loads of activities,walks and pubs. 1 pub a ten minute walk from the cottage called the Ostrich in new land is amazing plenty of real ales from local breweries and the food is just amazing well worth a visit. Eileen and her husband were very welcoming and nothing was too much trouble, they told us of places of interest and there was lots of brochures. The cottage itself was immaculate and there was everything at hand. I would certainly recommend the cottage to anyone who wanted a wonderful holiday in a beautiful spot. Plenty of eating places and the cottage is very good for getting around all the local beauty spots. Probably the best holiday let we have ever experienced; and we have been to quite a few! Excellent in all respects, plus thoughtful touches such as sweeties and cakes to greet you. Very kind owners who add little touches to make your stay special. 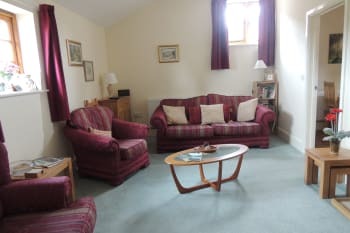 The cottages are comfortable,very clean and cosy. Our daughter stayed overnight and went to her wedding from here. There was plenty of room for her to get ready and her bridesmaids to join her before going to her wedding. I would recommend for anyone attending a wedding close by. Plenty of beautiful countryside for walks and tourist attractions but intermittent phone signal and no wifi so it's difficult to stay in contact with anyone. However for a getaway from it all its perfect.